PORT MORESBY, Papua New Guinea -- Disagreement over the body that resolves global trade disputes split Asia-Pacific countries at an international economic summit, leaving the annual gathering the victim of a trade war between the world's two biggest economies. The Liberals have been championing changes to the World Trade Organization, which has drawn the ire of U.S. President Donald Trump, organizing a meeting last month in Ottawa to start crafting a road map for reforms. The U.S. has openly blocked the appointments of new judges to the WTO's dispute settlement mechanism, known as the appellate body -- a tactic that threatens to paralyze the organization and prevent it from making decisions. Prime Minister Justin Trudeau brought the issue up during a meeting with Chinese Premier Li Keqiang on Wednesday in Singapore. Trudeau's office said at the time the two sides agreed to deepen their co-operation through organizations like the WTO. But on Sunday, it appeared that both China and the United States were part of the reason the Asia Pacific Economic Co-operation summit ended deadlocked on a path forward for the WTO and trade around the region. "There was broad agreement on how we need to support our citizens and work forward towards better co-operation," Trudeau said at his closing press conference. "But I don't think it will come as a huge surprise that there are differing visions on particular elements in regards to trade and those prevented there from being full consensus on the communique document." When asked specifically which countries were involved, Trudeau said the United States and China were among a larger group. The outcome seemed destined from the start of the summit as China and the United States used the annual forum to lay out competing visions for trade and investment at the gathering of nations who combined represent about 60 per cent of the global economy and half of global trade. Chinese President Xi Jinping and U.S. Vice-President Mike Pence traded barbs Saturday in a battle for global influence. Both left the summit by early Sunday afternoon amid what reports described as tense backroom negotiations on the wording of the final communique from the summit. Trudeau met Sunday with the leaders of two key trading partners -- Japanese Prime Minister Shinzo Abe and Australian Prime Minister Scott Morrison -- where there was talk about the summit and the future of a trade deal among 11 Pacific Rim countries. 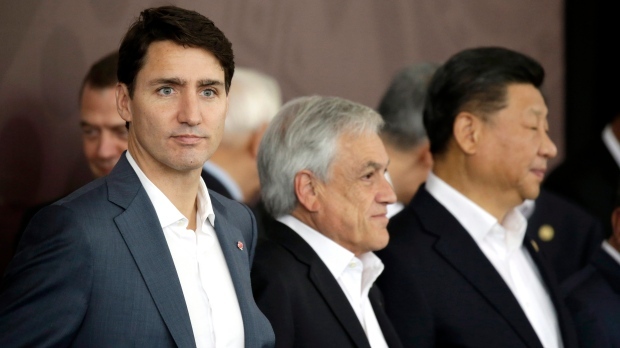 The deal, known as the Comprehensive and Progressive Agreement for Trans-Pacific Partnership, or CPTPP for short, has been a repeated topic of conversation for Trudeau during his time in the capital of this island nation. Canada became one of the first six signatories to ratify the CPTPP, bringing it into force in December. Observers say there is chatter about admitting the United States and China into the CPTPP to create a further-reaching regional trade pact. Speaking through a translator, Abe said he was ready to work with Trudeau "to expand this trade area which will have the free and fair rules" and forge a closer relationship "to address various global challenges." Morrison noted that the countries who ratified the agreement were "leaving the door open for others to come join, which we would welcome." Having either the U.S. or China in the deal would help small- and medium-sized economies counteract the influence of either country, said Sen. Yuen Pau Woo, an expert on the issues facing the Asia-Pacific region. "If you're a big economy and you can bully your way around to get preferences for your industries only, then there is a logic to negotiating, bilaterally but that does not benefit the region as a whole," Woo said. "It creates rivalry and tension and is generally not favourable to the promotion of economic growth, peace and security in the Asia-Pacific, which is still a very volatile part of the world." In his meeting with Morrison, Trudeau said Canada and Australia have been "aligned over these past couple of days on big issues of trade and the rules-based order," but noted that "conversations are going on to the last minute." At his closing press conference, Trudeau said his government will make sure Canadian interests are protected as the agreement unfolds. He also said the Liberals would fulfil the government's obligations under the agreement when asked about opening up more of Canada's protected dairy sector. "There is still of course work to be done, but there is no question that this has been a very good trip to celebrate that we're moving forward on a great trade deal that completes Canada's access to almost two-thirds of the global economy under free trade deals," he said. Sunday marks the last day of Trudeau's 10-day trek across Europe and Asia. Trudeau first marked the 100th anniversary of the end of the First World War with other world leaders in Paris before travelling to Singapore where he pitched a free trade deal with a 10-nation bloc in Asia, known as the Association of Southeast Asian Nations.